Welcome to Brightwater Fly Angler! Thank you for your interest in Brightwater Fly Angler. Have you ever been fishing or tying and said “It sure would be nice to have….”? That is what Brightwater Fly Angler is all about. We manufacture and sell unique products for the fly fishing industry. As an avid fly fisher I am always paying attention, watching and thinking about new products to help make your fishing experience easier and more convenient. 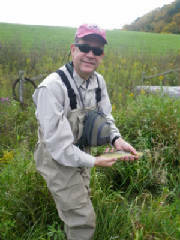 We are located in a hotbed of fly fishing, suburban Chicago. Seriously. Within a few hours driving time you can be pursuing Trout on a Driftless Area Spring Creek, Steelhead on a Great Lakes Tributary, or Smallmouth Bass, Largemouth Bass, Carp or Panfish in one of our warm water lakes or rivers. Wouldn’t you call that a hotbed? Browse this site, it is still under construction and will be updated on a regular basis. Set a spell, take your shoes off and enjoy the site. Genius is a bend in the creek where bright water has gathered.